When someone gets bitten by the travel bug and decides they want to go on vacation, they might assume that the hardest question they’ll have to ask is a simple “where?” That is certainly a great start—and your first and most important decision—but in modern travel, it’s not the only choice to make. Today’s travel industry is booming in large part because there are options for everyone—making travel accessible to the masses like never before. No matter who you are and no matter how you prefer to travel, there are options perfectly suited to provide you what you want at a price you’re comfortable with. It's a new Golden Age, but the limitless options can be overwhelming if you look at them without knowing generally the kind of traveler you are and the travel experiences you seek. Are you organized or carefree? Do you like flame kissed s’mores or haute cuisine? Follow our handy guide below to figure out your travel style! Does sleeping under the stars and warming your hands on a roaring campfire sound like the perfect vacation to you? If so, you just might be a Happy Camper. Happy Campers revel in getting Out There. That could be deep into the backwoods, or 15 feet from your car, pitching a tent, or gassing up the RV. From isolation deep in America’s 58 National Parks, to neighborly campsites found on the outskirts of major cities, camping is a fun, affordable, relaxing style of travel. Travelers looking for an opportunity to save money, meet locals and fellow adventurers from all over the world, and experience what life is really like in a particular area, can often be called Backpackers. This is a no-frills way to travel that is perfect for individuals without a set itinerary or schedule. Wandering around carrying nothing but the essentials, acting as a totally self-contained unit allows for compete freedom—and a willingness to forgo luxury, and sleep and eat simply, opens the world up to people looking for a truly authentic experience. 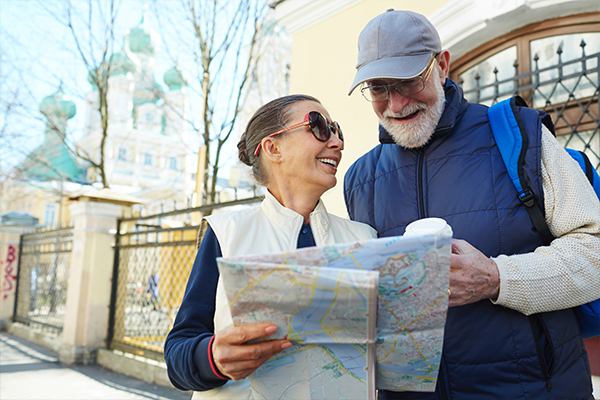 Many travelers enjoy rolling sightseeing and visits with loved ones into a single vacation—if this is you, we call you an Honored Guest. An Honored Guest bases his or her route on where they have friends or family to host them. This type of travel is the perfect way to stay in touch with distant friends and relatives—nothing builds closeness like staying under the same roof, plus it gives loved ones the perfect opportunity to take you sightseeing in their hometown. If you optimize every moment of your vacation, fill it with fun, educational, or destination-specific activities, you might be a Planner. Vacation Planners have a very carpe diem attitude when it comes to travel. Designing each aspect of their trip—from flight times to rental car types to hotel locations—they always seize the day and take full advantage of what a location has to offer. Up early every morning, they pack in the action, researching before their arrival, and keeping to their well-planned schedule until the moment they leave. Planners often joke that they need a vacation after their vacation! The polar opposite of the Planner, the Wanderer’s motto is “I love the unknown,” and their vacation plans consist of… let’s see what happens. At most, the wanderer plans dates, accommodations, and one or two must-do activities. They know that they’ll go snorkeling sometime during their week on Oahu, but beyond that? They’ll figure it out when they get there. A relaxing vacation style, Wanderers might not care to see a destination’s most famous sites. Cruising is a great vacation style when you want to luxuriate in relaxation. Unpack once, then enjoy a combination of free time onboard with your every need catered to, and port stops in dream destinations. Spend anywhere between several hours and a few days at port, enjoying either curated optional activities, or free time to explore. If you want to make one phone call to book a trip that includes both a sense of camaraderie and an expertly designed and executed itinerary, guided group tourism may be for you. Providers like YMT Vacations put together guided tours that take you through some of the world’s most beautiful areas, showing the Staying and traveling together brings guests and their experienced tour guides close like no other travel style. The opportunity to bond with strangers from all over the world, often leading to lifelong friendships, while enjoying expert guidance, often from local guides, is one of the reasons guided group tourists come back to their favorite provider again and again. For guests with unlimited funds, the world truly is at their feet. Stunning hotels, exquisite food, private planes and islands are just the start of what those with the deepest of pockets can arrange. Concierge services are there to cater to wealthy travelers’ every whim, and have been known to arrange private visits to Buckingham Palace, plan a professionally filmed mid-air wedding, and even ship an authentic rickshaw from Delhi to the United States. If your attitude toward your time away is, “spare no expense,” you can consider yourself a Luxury Traveler. Pay one fare. Unpack one time. Then, it’s time to relax! All-inclusive travel is a great option for guests who want to be taken care of in a well-designed paradise. All-inclusive resorts are common in warm, tropical areas like the Bahamas and Jamaica, and offer everything guests could possibly want on-site for one price. Food, drinks, and certain activities are all included, making all-inclusive travel a relaxing way to vacation. Our final type of traveler has a lot of overlap, especially with the Wanderer and Camper. Road Trippers have a strong passion for the open road. They love the freedom and casual nature of traveling by car. Free to stop where they want, eat where they want, sleep where they want, and most importantly, go where they want, the Road Tripper is the modern version of the Great American Cowboy. The Road Tripper’s open range is the over 4 million miles of paved roads in the United States. No matter the type of traveler you are, the world is a beautiful place that you can experience and enjoy. YMT is one of the leading providers of group travel to destinations throughout the United States, Europe, and beyond. To make your plans to join a fully-escorted vacation, call your travel consultant or YMT Vacations at 1-888-756-9072.